. Published on April 2, 2018. Сoworking spaces. They’re rapidly growing in popularity and spreading all across the map. Why? Because, just like entrepreneurs, they’re flexible and diverse. Coworking locations are great for the lone dealmaker who needs a desk to herself a couple times a week. But they’re also great for the small business team that needs to meet in a conference room every Tuesday at 2. With their varied sizes, capabilities, and price ranges, it can be difficult to narrow it all down and find the best coworking location for you (or your business)! Located smack-dab in the middle of San Francisco (as well as St. Louis, MO), covo is a phenomenal bang for your buck. Starting at just $4 an hour for single seating, covo’s affordable prices and the amenities that come with it (lightning-fast internet and printing, among others) should guarantee they’re on anyone’s list of coworking spaces to check out. With a tap room and coffeeshop, it’s no wonder they’re rated 5 out of 5 stars on Yelp. Located in Sacramento, The Urban Hive is the largest coworking community in the city. Rated as one of the coolest coworking locations in the country by Paste Magazine, The Urban Hive is, well, a hive of networking opportunity, with special member events. Chalk all that up with coffees, cookies and Taco Tuesdays, and you’re set! Located in both Hillcrest, San Diego as well as La Jolla, is fond of open spaces as well as open minds. Their locations feature big rooms where diverse groups of professionals can come work together in groups, or simply work alone in the company of others. On top of that, CO-MMUNITY has a working agreement with Workinton in Istanbul, Turkey- giving you a global reach. Downtown Works, located in downtown (get it?) San Diego is coworking flexibility defined. 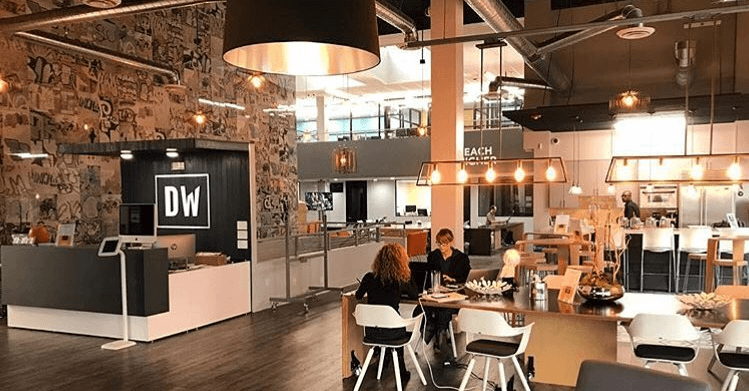 One of the few coworking places that offer month-to-month membership (meaning that you can pick and choose whether you continue each month), Downtown Works are an affordable and sociable location to do your business. And plus, they welcome dogs- who can’t love that? Speaking of dogs, Kleverdog, located in sunny LA, rounds out our list. Kleverdog takes the “social” aspect of coworking to the max, and encourage their members to talk amongst themselves and share their projects (if two heads are better than one, why not twenty?). With totally flexible and affordable prices (in LA, that’s tough to beat) Kleverdog is one hound you don’t want to run away from. MightyCall is easy to set up, easy to use and priced for small business. In short, toll free numbers and vanity numbers really allow your business to stick out from the crowd. We explain, how!